Group flights for Corporate incentives, Team building or family and friends adventures ! 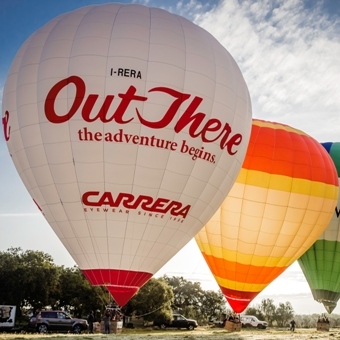 We operate a large fleet of balloons of various sizes, comfortably carrying from 4, 5, 6, 8, 10 up to 18 passengers. Our variable fleet and dynamic crew allow us to be very versatile to satisfy every request; from flying regular early morning flights, Privilege exclusive VIP flights, private family group excursions and large groups of up to 100 passengers. We arrange spectacular flights for large groups, Corporate events, Team building and business Incentives. Also an ideal activity for extended family and friends excursions. During the warm season balloon flights are always in the early morning, and very large groups, when possible, are divided in two or three smaller groups and flown on consecutive mornings. Passengers arrive with their own bus or van to the launch field for meeting, greetings and briefing. Here passengers meet their pilot and crew at their designated balloon and assist with last phase of hot inflation of the balloons. Takeoff and free balloon flight of approx. 1 hour depending on wind and weather conditions and at pilots discretion. 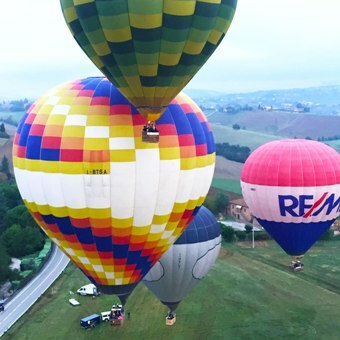 Several balloons takeoff simultaneously from the same field and fly in formation for a spectacular event! A photographer's paradise! 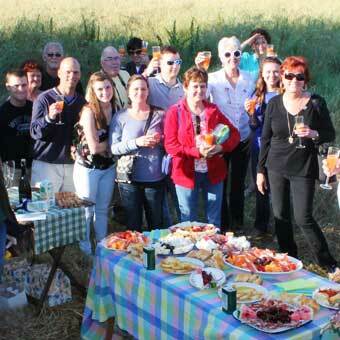 Usually the balloons manage to land all in proximity of each other and after landing passengers and pilots enjoy a Prosecco Toast (Prosecco wine and fruit juices) with Group photos all toghether. The bus or van will follow the ground crew vehicles during flight and wait at a convenient location near the landing site. After having said our goodbyes, passengers board their bus again and drive to the next destination or back to their hotel. Duration of excursion approx. 2½- 3 hours. 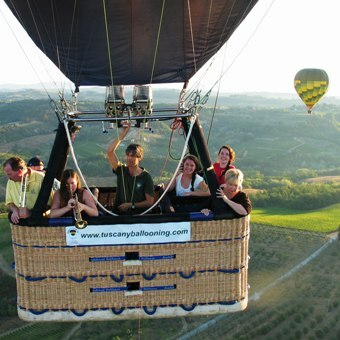 Our usual takeoff location is in Tuscany, Chianti, near the town San Casciano in Val di Pesa, situated approx 25 minutes drive from central Florence, easily accessible along the main road from Florence to Siena. On request we do move our fleet throughout Italy to other destinations closer to passenger accommodation to suit our customers. It may be necessary for us to carry out a preliminary inspection of the intended takeoff site and the flight area for accesability, orography and eventual airspace restrictions.